This SpringerBriefs is an overview of the emerging field of wireless access and mobile network virtualization. It provides a clear and relevant picture of the current virtualization trends in wireless technologies by summarizing and comparing different architectures, techniques and technologies applicable to a future virtualized wireless network infrastructure. The readers are exposed to a short walkthrough of the future Internet initiative and network virtualization technologies in order to understand the potential role of wireless virtualization in the broader context of next-generation ubiquitous networks. Three main wireless virtualization perspectives are explored, along with the potential challenges and requirements of a sustainable wireless virtualization framework. Finally, it presents an example of a multi-perspective wireless virtualization framework. 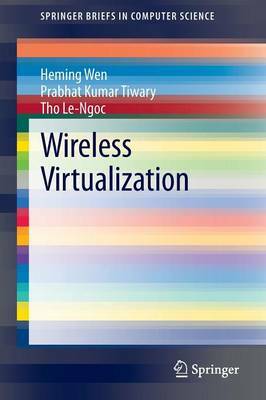 The readers learn the latest concepts in the application of wireless virtualization as well as its relationship with cutting-edge wireless technologies such as software-defined radio (SDR) and cognitive radio.